Peppermint Heaven is the LA raised ‘80s synth-pop duo Juno and Spark, who’ve taken their name from a pre-Smith’s Morrissey song. The duo spent months honing their sound in LA’s plush Echo Park area; writing, recording and mixing to get their sound right. After a wintry trip to London in early 2013, the boys decided the UK would be the perfect launch pad to begin their foray into the world of music as their influences included acts like Tears For Fears,The Pet Shop Boys and New Order. Their track, ‘The Delicious EP’, features remixes of ‘Into Gold’ and ‘So Unbelievable’ by Mike Rizzo (Britney Spears) Almighty and Buzz Junkies. Released this autumn/fall on Megahit Records, the EP is aiming for some mainstream chart success.DJ Times’ Magazine Dance/Crossover listings has the track currently at number 8 on their charts, sharing company with the likes of Avicii, Katy Perry and Beyonce. Also, featuring twice on the Twit Music homepage the track has garnered nearly 1000 plays on the service. 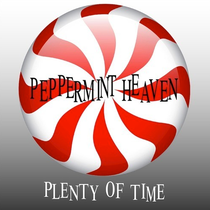 Check ‘Plenty Of Time’ below, it’s out 7 July on Megahit Records.